Peter Wohlleben is a German forrester who has revolutionized his field by developing community forest management that does not require pesticides or heavy machinery, and recruits local communities as stakeholders in forestry preservation; but the thing that made him known around the world is his 2016 book The Hidden Life of Trees: What They Feel, How They Communicate—Discoveries from a Secret World, which presents evidence for unprecedented (and even spooky) degrees of cooperation among trees in a forest. Wohlleben conducted an interview for Yale's Environment 360, explaining to Richard Schiffman the way that his own experience with his forest has been informed by some of the most interesting and exciting findings from the scientific literature, and how this approach has made him reconsider the "sentience" of trees. Wohlleben: One thing is that mother trees suckle their children, they feed the young tree just enough sugars produced by its own photosynthesis to keep it from dying. Trees in a forest of the same species are connected by the roots, which grow together like a network. 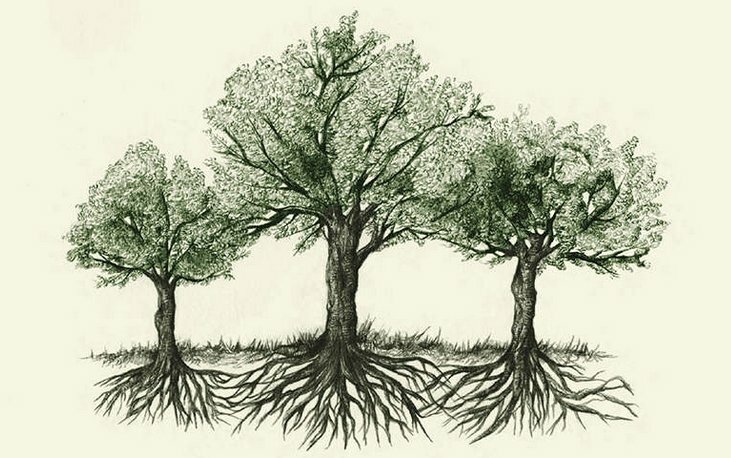 Their root tips have highly sensitive brain-like structures that can distinguish whether the root that it encounters in the soil is its own root, the root of another species, or the roots of its own species. If it encounters its own kind, I don’t know if scientists yet know how this happens, but we have measured with radioactive-marked sugar molecules that there is a flow from healthy trees to sick trees so that they will have an equal measure of food and energy available. e360: How do the healthy trees that feed their sick companions benefit? Wohlleben: If sick trees die, they fall, which open gaps in the canopy. The climate becomes hotter and drier and the environment becomes worse for the trees that remain. In the forest I manage, students from Aachen University did a study that shows that the parts of the forest that grew naturally were 3 degrees C cooler than those that are managed and disturbed by humans. The world is trying to limit warming from climate change to 2 degrees, but undisturbed forests can do even better than that. Forests create their own microclimate. When we thin forests, the temperature rises, the humidity goes down, evaporation increases, and all the trees begin to suffer. So trees have a stake in supporting one another to keep all members of the community healthy. e360: You tell one amazing story in the book about trees keeping neighboring stumps alive. Wohlleben: This one beech tree was cut four to 500 years ago by a charcoal maker, but the stump is still alive — we found green chlorophyll under the thick bark. The tree has no leaves to create sugars, so the only explanation is that it has been supported by neighboring trees for more than four centuries. I made this discovery myself, and later learned that other foresters have observed this happening as well. e360: Are there other ways that trees help each other? Wohlleben: We know that trees also exchange information. When one tree is attacked by insects, we can measure electrical signals that pass through the bark and into the roots and from there into fungi networks in the soil that alert nearby trees of the danger. The trees pay for this service by supplying the fungi with sugars from their photosynthesis. And the fungi in turn protect their host trees from attacks by other dangerous species of fungi and contamination by heavy metals. Trees also send chemical signals through the air when they are attacked by insects. Nearby trees receive these messages and have time to prepare their defenses. Scientists like Suzanne Simard [who teaches forestry at the University of British Columbia in Vancouver] have labeled this amazing web of communication the Wood Wide Web.